A summer inspired salad - woohoo! It's about TIME! The past few days have been absolutely gorgeous. By far the best weather days we have had all year. Yesterday practically felt like summer!! Which you know got me super excited. Everyone here is welcoming the sunshine and warmth with open arms. It seems like so many people have been outside running, walking, biking, dining on patios, walking their dogs, cooking on the grill, etc. We went on a walk last night with Rhys and Norm and our neighbors were shocked at how big Rhys is because they haven't really seen him since the fall when he was itty bitty! It's like we are all coming out of hibernation! By the way, Rhys is going to be 8 months old on the 6th (in just a few days!) and I am still trying to figure out where the time is going. Month 7 has been the absolute best! I plan to share more about the past few months soon. But what I really came here to talk about is this salad. O M G. It's a salad without being a salad salad. You know what I mean? This type of salad is my favorite. Don't get me wrong, sometimes a big bowl of leafy greens sounds delicious and totally hits the spot. But sometimes leafy green salads can feel....boring. Lucky for us, this salad is the opposite of boring. It's light, refreshing, super summery, and packed with flavor. I have a feeling you might be attending a few potlucks or BBQ's now that the weather is warming up. 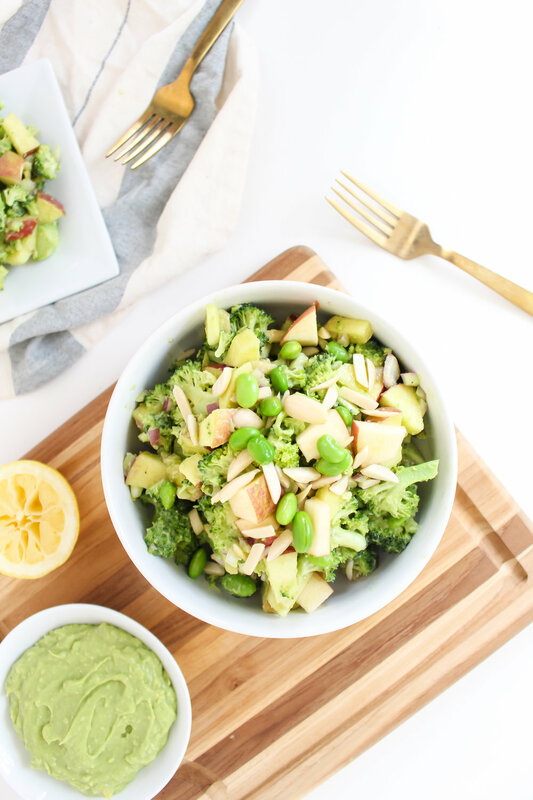 If you are looking for a healthy, fun twist on a traditional side dish, this recipe is for you! And the best part about it? No cooking required! Yep! It's totally raw. Woop woop! And no cooking means no pots, pans, sautéing, boiling, roasting, nothing. Just a cutting board, knife, and a food processor or blender to whip up the dressing. and CAN WE TALK ABOUT THE DRESSING?! I was going to make a more traditional dressing for the broccoli salad, but I wanted something extra creamy and remembered I had a bunch of avocados in the fridge (it helps prevent them from ripening too fast!) that I bought earlier in the day. This dressing is creamy and dreamy!! It's full of healthy fats which provide just the right amount of richness without feeling heavy. The acid in the sauce really brightens it up and balances everything out. Scott and I gobbled it up last night! It's one of those salads where you just keep going back for more. And since it's packed with so many good-for-you ingredients, it's a dish you can feel really good about nourishing yourself with. Fruit, veggies, avocado, and loads of flavor. What more could you want out of a salad?! 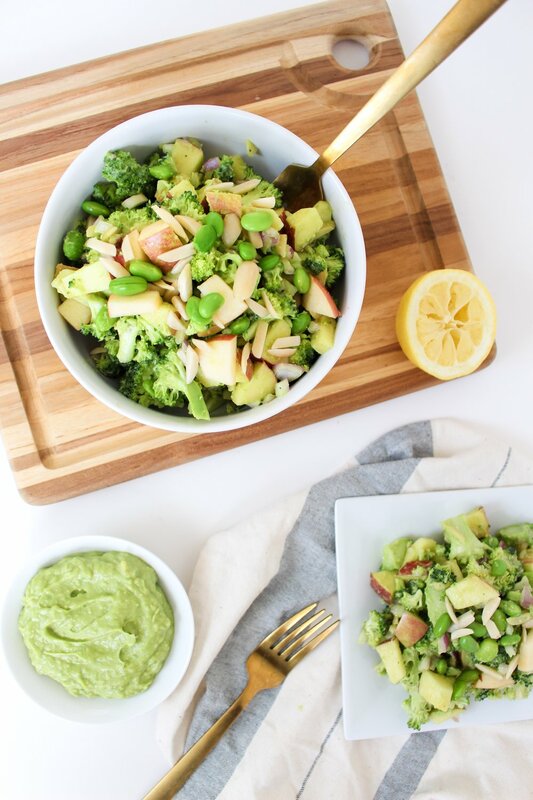 Place the chopped broccoli, slivered almonds, red onion, edamame, and chopped apples in a large mixing bowl. Mix together and set aside. Peel the avocado and remove the pit. Place all dressing ingredients in the food processor and process until smooth. Pour the dressing over the salad and toss until everything is coated and serve! This salad can be refrigerated for a few hours before serving. Leftovers will keep in the fridge for about a day after making.